Friends of Water has filters specifically engineered to remove all of the types of radiated contaminants. 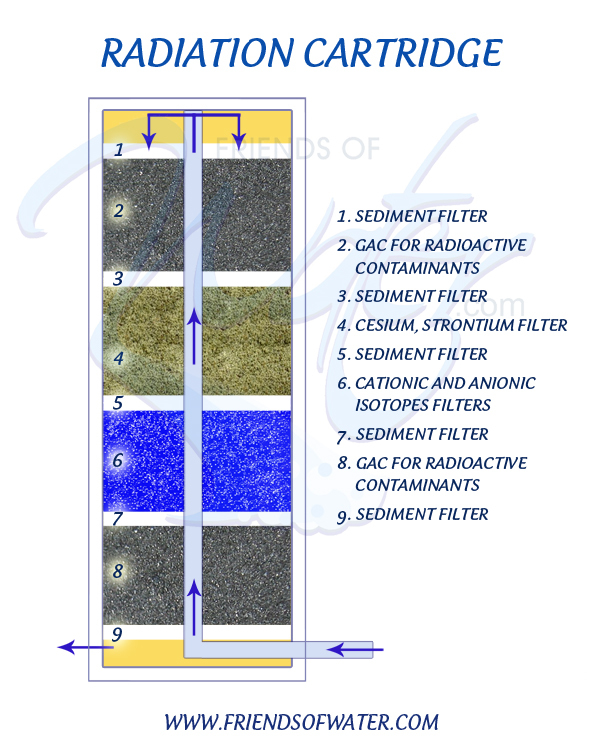 They combine 5 types of filter media, each which selects for one type of radiated contaminant. Click this link to see kitchen radiation water filters in the store. You can also filter out other contaminants. Here is a link to the replacement radiation cartridge. 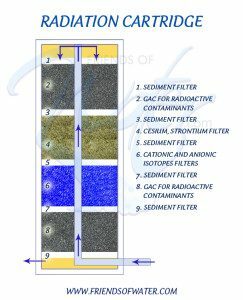 The filters work on radiated iodine, cesium, strontium, plutonium, uranium, radon and other radiated contaminants. The third is a mixed bed, using ionic exchange, with two resins, one which selects for cationic ions and the other for anionic ions. (Anionic have more electrons than protons giving it a negative electronic charge. Cationic are positively-charged ions.) This bed works on plutonium, uranium, and other radiated materials. What these cartridges are – is the best combination of materials known to be extremely effective against radiated and contaminated materials available. Between them, the media work on all radiated compounds found in water. How much will be removed will of course depend on the levels of radiation they face, the flow rate of water (slower water flow means more filtration) and whether the contaminants are all of one type, or spread over the range. Water chemistry is complicated and ever-changing. What you can, and we submit should, always do is get as much of the right filter material working for you as you can. More of the right filter materials means a higher level of protection. What some customers are doing is keeping one or more radiation filters on hand, to put into their kitchen filters (they fit all we sell) in the event of emergency. Fluoride and chloramine and others such things found in the water can cause health risks over time. The more you ingest, the higher the risk. Radiation can peak and decrease more quickly.